We recently spent a weekend of wine tasting in Napa Valley. Finding great food and wine as well as great accommodations was not the problem; our biggest issue was narrowing down all of the excellent choices. However, with some tips from our resident wine experts on their favorite Napa vineyards, we were able to assemble a tasting itinerary that was truly excellent. Where to Stay in Napa? The Napa Valley area, which is comprised of several cities including Napa, Yountville, St. Helena and Calistoga, is laden with places for visitors to stay. While there are some big name hotels, many people feel that it is best to stay in a bed and breakfast to get the true wine country experience. This trip, we chose to stay at the historic Candlelight Inn in Napa. 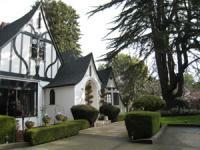 The Candlelight Inn is Tudor in style and was originally built in 1929 by the Napa postmaster for his wife. Each of the 10 rooms in this bed and breakfast is decorated uniquely and has slightly different amenities. We stayed in the very comfortable Candlelight room, the former master bedroom-bathroom suite. A stay at the Candlelight includes breakfast, afternoon snacks and wine, and on some days they even hold wine tastings. Looking to stay in high style? Try the Auberge du Soleil in Rutherford. It comes highly recommended for posh comfort, but was a little more per night than we wanted to spend on this trip. 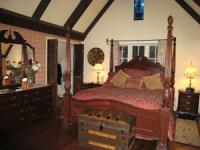 We also admired the Vintage Inn in Yountville and would like to stay there on a future trip. It has an ideal central location, and is walking distance to several great restaurants and shopping. 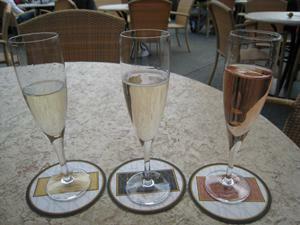 The biggest challenge is choosing which wineries to visit when you are in Napa. Certainly visit the vineyards that produce your favorites, but a trip to wine country is a great opportunity to find new favorites, too. Remember that while most wineries in Napa offer wine tastings, some require you to make appointments; others have open hours for tasting, but ask that you call ahead if you want a tour. We started our day at a small family owned Napa winery, Heitz Wine Cellars. Heitz is renowned for their Cabernet Sauvignon and their Martha's Vineyard appears on many Best Cabernet lists. Centrally located on St. Helena Highway south (close to Dean and Deluca if you are planning to stop and get a picnic), Heitz is open to the public daily for tasting. When we visited, they were pouring a flight of four Cabs including the Martha's Vineyard. Our resident Cab fan was very pleased with the wine and the complimentary (really!!) tasting next to the massive fireplace. No trip to Napa would be complete without a stop (or two or three) at gourmet retailer Dean and Deluca. Their cheese counter, selection of spices and sweets rival one another for most impressive offerings… until you see their wine room and the deli and the bakery counter. Where else can you get your lunch sandwich with brie on a baguette? Looking for a kitchen gadget? They have knives, ramekins, graters for nearly everything you could imagine grating and plenty of other cooking accoutrements. Next, we headed to Rombauer Vineyards. Set well off the main road, the Rombauer tasting room was filled to capacity, despite the diminutive sign that we almost missed. They were pouring their Carneros Chardonnay, their Cabernet Sauvignon and we also tried their Napa Valley Zinfandel. My favorite was the Zin, with rich berry flavors. The gardens are lovely; make sure you enjoy the valley view through the trees outside the entrance, or take a walk through the brilliant greenery of the grounds. There are several interesting antiques on the property as well. What could be better on a beautiful afternoon in Napa than sitting on a patio overlooking the valley and drinking a glass of bubbly? Mumm Napa has a lovely location along the Silverado Trail (the other main thoroughfare in the Napa Valley) with both indoor and outdoor tables in their tasting room. Mumm's sparkling wine has the classic qualities of champagne that so many of us revere. The winery is open daily for tasting, periodic tours and self-guided tours of their Ansel Adams art gallery, containing hundreds of landscape photos, by Adams and other artists. Our last winery stop of the afternoon was the Robert Sinskey Vineyards. Sinskey is known for his French style wines and we were utterly impressed by the Pinot Noirs they were pouring. While all the Sinskey wines we tasted were excellent, we ended up purchasing several bottles of their Los Carneros 2005 Pinot to send home. The tasting room is gorgeous and comfortable and the people working the counter were among the friendliest we met all day (even before we agreed to buy some wine). One interesting thing we learned - Robert Sinskey's wife, Maria Helm Sinskey is a renowned chef. Periodically they do wine pairing dinners, matching gourmet cuisine to some of the vineyard's best vintages. Wine club members get first dibs on reservations. Sinskey was a perfect place to end our tasting day, since it was our hands down favorite. We may have been done visiting wineries for the day, but the Candlelight Inn offered us one more tasting before dinner. A representative from the Arger-Martucci winery brought us several wines to try, along with the appetizers supplied by our B&B. Located in St. Helena, Arger-Martucci offers Cabernet Sauvignon, Pinot Noir, Chardonnay, Viognier, and a late-harvest Sauvignon Blanc. We tried them all. While none were standout favorites, they were all good and very drinkable. We finished our day with once-in-a-lifetime dinner at the French Laundry, Chef Thomas Keller's piece de resistance in downtown Yountville. A perfect end to an ideal day in wine country.